This was another that I'm not sure WHY I decided to order it but ended up being very happy I did! Disco Biscuit is a bright (almost neon) fuchsia jelly with iridescent blue micro glitter. I LOVE the glitter in this one. I would have never thought of this combination of colors, but it's quite stunning! I used three coats to build up the opacity (it IS a jelly after all), then did a coat of Gelous and Seche Vite to make it perfectly glassy smooth. 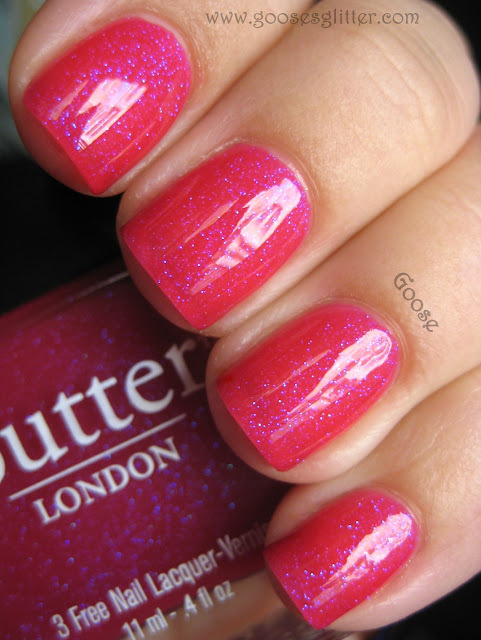 butter LONDON polishes can be purchased at Ulta (in stores and online) as well as the butter LONDON website. They retail for $14 each. This is so great! I love the blue shimmer! Love it! I have that one too, but haven't worn it yet. Looks great on you. Oooh this pink is so lovely! The blue glitter in it makes it fabulous! Oh Goose how I want your nails!